6-Piece Copper Bakeware Set Just $14.88! Down From $37! 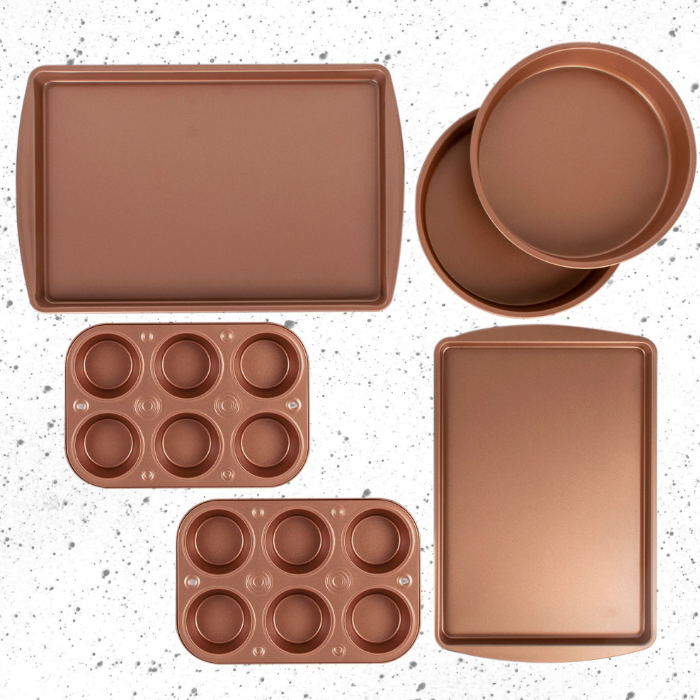 Walmart has this 6-Piece Copper Bakeware Set on sale for just $14.88 down from $36.88 PLUS :fr store pick up or FREE shipping for orders $35 or more! Jumpstart your home baking ambitions with the BakerEze 6 Piece Copper Nonstick Bakeware Set. Ideal for equipping your kitchen with an assortment of must-have bakeware essentials that are now available in a gleaming copper nonstick finish. This bakeware set includes basic pans needed for making cookies, cakes, muffins, and more. The reinforced nonstick Copper DuraGlide PLUS finish provides uniform heating so food bakes evenly and does not stick to the surface; making for easy release and cleanup. The BakerEze 6 Piece Copper Nonstick Bakeware Set is the perfect stylish addition to your home kitchen.